Remember this famous line from the movie, The Fugitive? Dr. Richard Kimball’s wife has been murdered, it turns out, by a one-armed man. A man, who despite having only one arm, and using a “mechanical hand” or more correctly called, a prosthetic arm, was able to do quite a bit. Granted, he was used to having only one arm, but still, he accomplished a lot, especially considering that his prosthetic hand was cosmetic, and did not have any opposable fingers. He broke into the Kimball apartment, killed the wife, fought and wrestled with Dr. Kimball, managing to get away, and eluded capture for most of the movie. Pretty good for a one-armed man, I think. I should know. I’ve been the one-armed woman for, what seems like two weeks, but in actuality is only going on four days. And one of those days does not really count, because I was asleep for a good part of it. I have new admiration for all people who function with only one upper appendage. Try to eat left-handed? I’m thinking of writing a diet book, calling it The non-dominant hand diet: a successful weight loss strategy for those frustrated by conventional methods. The premise is that one may only eat what food they could manage to bring to their mouths, using standard eating utensils and their non-dominant. hand. My theory is, that after a time, one would either lose weight, or give up and start eating all their food with their fingers, cave-man like, hunching over the plate least a morsel drop and become irretrievable. I’m still working out the details on this one. The down side? I could become really good at one-handed eating and actually gain weight. Still some bugs to work out I see. Try getting dressed. There are certain articles of women’s clothing that cannot be put on with only one hand. No need to say more. Have you ever tried to get out of bed without being able to roll to your side and push up with your arm? The first day I thought I was trapped in bed forever. But now, I’m seeing a second book in the works – Abd workouts for the one-armed. Perhaps I’ll get a guest trainer stint on The Biggest Loser. Okay, I know, I’m exaggerating. I can use my right arm for all sorts of things right now. Well, writing, typing, and anything else that does not require moving my arm away from my side. And I have a husband here to help me. I really do need to stop complaining. I am getting better at it. And it’s not forever. 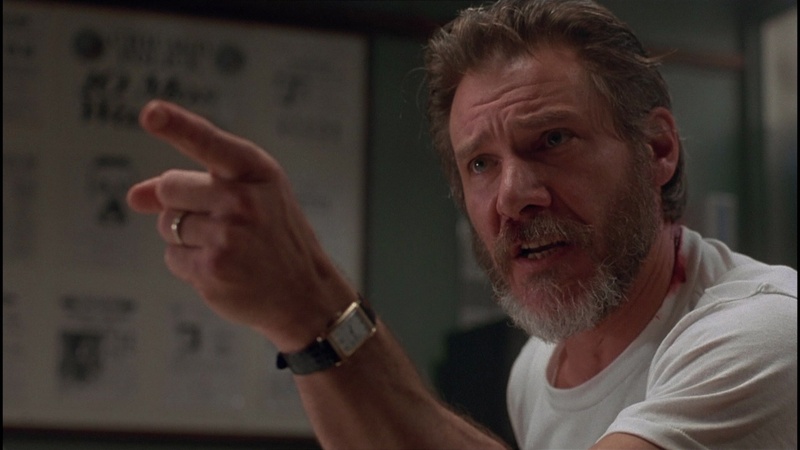 But suddenly I have a strange urge to re watch The Fugitive. This entry was posted in Satire Friday and tagged handedness, Humor, non-dominant hand, one-armed man, The Fugitive by Huffygirl. Bookmark the permalink. Thanks. Am on the way. Way to go Judy – after all, you needed the protein. I am getting better at it – haven’t resorted to picking up my food with my fingers yet. This is actually a great idea for a diet book for people who have too many dates and want to be alone more. But just think of all the experience your hubby can add to the résumé in the event he ever seeks employment at a bra factory. Now this image made me hoot. I pictured you as a giant water bug stuck on its back, legs flailing in the air. Thanks Margaret. I love your comments. Especially the one about if my husband may ever want to work in a bra factory some day. Isn’t that every man’s dream. Problem is, it turns out that most men are better at taking them off than putting them on. The image of me stuck in bed on my back like a giant water bug, legs flailing, is not far off. The only thing that gave me the abd strength to hoist myself out of bed was my incredibly full bladder. Otherwise, I might still be stuck there. I pray you are fully healed soon. Thanks so much Ann. Feeling better every day. Hope you feel better soon. Love the way you write! I will Martin. I won’t let any Asimov robots get me into trouble! I’ve remembered… it was ‘The Naked Sun’ by Asimov. A very enjoyable story. I’m going to check it out. I used to read a lot of Asimov. I accidentally chopped the tip of my thumb off once. Had a terrible time doing the simplest things. Made me realize how important a thumb was/is. I can’t even begin to imagine functioning with just one arm! Hope all heals fast and you are back to normal in no time. Chopped the tip of your thumb off? Ouch. Glad that is behind you. I’ve had it a little lucky in that I can use my right arm for some things – just can’t move it away from my body. I think it would have been really miserable had I not been able to use it at all. The first day it was completely numb and useless, so I really did not use it at all that day. Good to hear you are on the mend! A while back I had to switch from using my computer mouse with my right hand to using my left. It took a while, but I’m quite proficient now. I expect a person really would learn to eat with the non dominant hand before they lost any appreciable weight! You’re probably right Margie. I’m getting pretty good with the left-handed mouse too – that one was actually pretty easy, but does still feel awkward.